Attached is our December Crime Report for District 6. While we are up quite a bit from November (66 incidents), at 84 incidents we are lower than the past two Decembers (both had 99). We finished 2018 with 1,017 incidents, which averages out to 84.75 incidents per month. In 2017 we had 1,091 incidents at an average of 90.9 incidents per month and in 2016 we ended the year with 1,178 incidents and an average of 98 incidents per month. As you can see, overall crime in our district has gone down. While we have a long way to go (I am sure you are like me and would like to see this a lot lower), we are seeing less incidents. There is no proof of this, but the more all of us are following crime tips, reporting suspicious activity to 911, having Crime Watch Meetings, and encouraging our neighbors to be vigilant can not hurt in reducing overall crime in the district. I hope you are like me and want to see crime drop. Let’s all work together to see if we cannot make this happen. If you see or hear something suspicious, call 911 and report it. Do not hesitate reporting something that is happening to 911. If something has already happened, still report it – but to the non-emergency number – 311 from your cell phone or 317-327-3811 from your home phone. Reporting incidents helps the police. The news has been reporting lately about an increase in stolen vehicles. This has been due to people warming up their vehicles before they head off to work. With the expected below zero temperatures later this week, warming up a vehicle in a driveway can be very tempting. It also makes it tempting for someone, maybe some youth wanting a “joy ride”, to drive away while you are inside. We had about 15 stolen vehicle incidents in our district during October, seven in November, and eight in December from the incident maps. 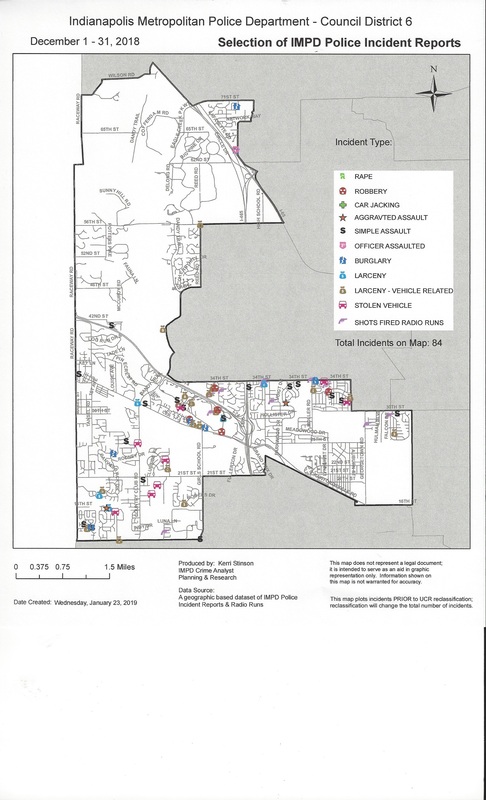 This is a large percentage of incidents in our area (the other large percentage is vehicle related larcenies). This is something that all of us can do something about to make our chances of being a victim lower. Do not warm up your vehicle in your driveway or a parking lot when you are not in it. Remember to not leave anything of value, or what may look like something of value in your vehicle. Always lock your vehicle. If everyone would follow those three tips we would probably see crime in our district go down even more. Dealing with a stolen vehicle or one that has been broken into is not a pleasant experience. 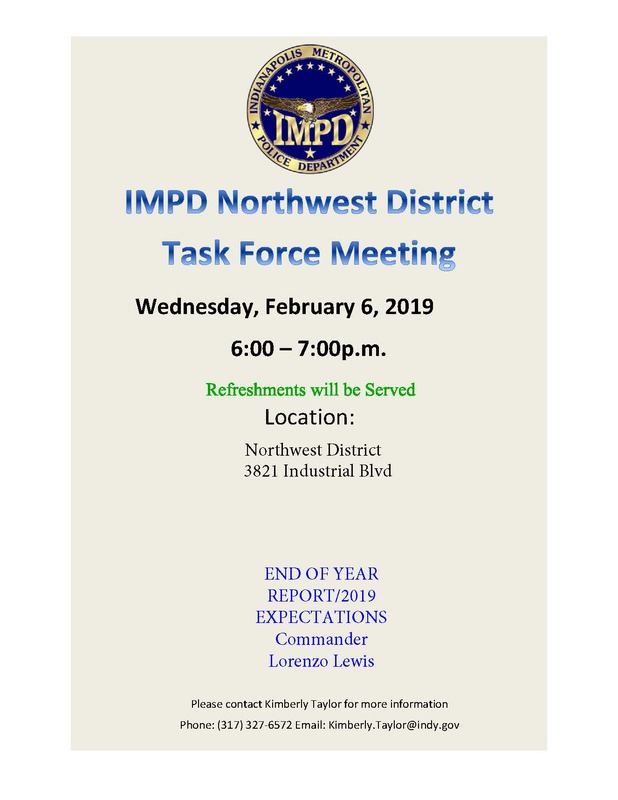 Our next IMPD Northwest District Task Force Meeting will be on Wednesday, February 6th, from 6:00 p.m. – 7 p.m. at their headquarters, 3821 Industrial Blvd. Commander Lewis will be giving an End of the Year Report for 2018 and Expectations for 2019. Sounds like a very informative meeting. See the attached for more information. This month’s “Coffee With A Cop” will take place on Tuesday, February 19th, from 9:00 a.m. – 10 a.m. at the McDonald’s located 4545 W. 38th Street. This is an excellent time to talk one on one with Commander Lorenzo Lewis and many of the officers who work hard for us every day. It is also a chance to let them know how much we appreciate what they do to make our area a better place for us. The flyer about this is attached. Looking forward to seeing many of you at the Task Force Meeting and/or Coffee With a Cop. Both are well worth your time. Please feel free to share this information with others who live in our District who may not be on my email list. Remember – if you see something – say something – call 911.